Madhava nidhana is a well known treatise which has taken appreciation by the large mass in ayurvedic field of understanding of the patho-physiology (Roganidana). The Author Acharya Madhavakara is the archetype among the pathologies of the time. The question still remains to everybody is that why such an authentic and authorities Acharya Madahava remained silent with respect to treatment. After a thorough review of this text ‘Madhava Chikita’ surely one will appreciate another compendium of work in the field of treatment too. Most of the chapter discussed in Madhava Chikitsa is at par with the sequence of the chapters of Madhava nidana. The line of treatments specified (in most of the diseases) are the true verses referred from either of Charaka samhita, Sushruta Samhita, Chakradutta, Yogaratnakara or Bhavaprakasa. Some of the formulation quoted in the vrindamadhava are found here also. Unique references and specific mentioning of some of the formulations and single drug therapies attract the special attention of the practitioners and researchers. The Ubhaya panchadashaka Yantra, Ubhaya Trimshaka Yantra etc memtioned under striroga chikitsa are distinctive references which determine the incorporation of tantric ways in Ayurvedic practices. The author Madhavakara is very keen about the wholesome and unwholesome diet and habits, in each disease. Instead of giving a long list of such substances/matters, author has given the routinely practiced food and beverages in this context this has increased the credibility of the diseases. As a part of Daivavayapshraya and Satvavajaya Chikitsa, several Mantra (Sacred hymns) and Bali (sacred oblages) are mentioned here and thus it looks different from the primordial literatures. Ultimately the text Madhava Chikitsa appears unique in its approach and utility. The text bestows new horizon to the fervent academicians zealons researchers, ardent Ayurvedic practitioners and fanatical PG Scholars of Ayurveda. Dr. M.S. Krishnamurthy born in Muliya Alike, Bantwal Taluk, South Kanar District, Karnataka completed his initial education from prestigious Institution of Karnataka Sri Sathya Sai Loka Seva Education Trust ® Alike. He completed his BAMS with IInd Rank and Gold Medal from ALN Rao memorial Ayurvedic medical college, Koppa and Post graduation MD (Ayu). In Bhaishajya Kalpana in 2002, from IPGT & R, Jamnagar, his PG dissertations grabbed best thesis award (2002-Pune). He started his career as a lecture in Alva’s Ayurveda medical college, Moodbidri. During the period he got selected in UPSC (2000), CCRAS (2001) and medical officer (Direct recruitment 2005 Karnataka). But he continued as a academician in the Ayurvedic College itself. The author obtained his Ph D from NIA, Jaipur (2008) under the able guidance of Proof L.K. Dwivedi for his work entitled “Pharamaco Chemical study of Takrarista and its SOP standardization. The author is also has the credit of young scientist Award (1999), National Congress on Traditional medicine, Varanasi and Bharateeya Vijnana Parishada Puraskar (2001-2005). This volume of English translation of Madhava Chikitsa is worth appreciable work of Dr. M.S. Krishnamurthy. It gives me great pleasure in writing the foreword for this book. Ayuveda is well known for its two noble principle of life i.e. preservation and promotion of the existing health and effort to overcome the discomforts caused in due course of life. Even though earlier point is of more concern, much emphasis is given to other aspect, as it nees immediate attention to cure the iffness. Secondly role of a wise physician is the indeed need in this context. While discussing the pathophsiology of various diseases, the guidelines given by Acharya Charaka, Sushruta and Vagbhatta are worth memorable and time tested too. 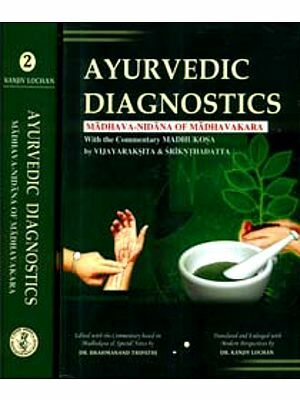 Later, Acharya Madhavakara has given clear guidance is his text Madhava Nidana to help the budding physicians and practitioners for understanding the pathophysiology of various diseases. But Madhava Chikitsa, another work of Madhava is less explored among the teachers, researches as well as practitioners. Probably less available literatures, concise information and minimum range of recipes have contributes in this regard. At this juncture, Dr. Krishnamurthy has taken timely, wise and nice decision of translating this text into English. A thorough review of the literature a deep insight towards the herbs and the herb mineral formulations and line of treatments is worth appreciatble. I believe that the work of the author would meet the requirement of the student’s teachers, researchers and practitioners. The comments and notes given by the author in respective areas will certainly help to modify the formulation and assist the physicians for apt therapeutic usage. A lot of meticulous works seems to have gone into preparing this voluminous book for which Dr. M.S. Krishnamurthy deserves all praise. I wish the author and this book all the success. During the pretty period of teaching in Ayurvedic academia, I find pleasure teaching hundred together formulations and a number of single herbs or their primary and secondary dosage form. But, the line of treatment remains the same for the identical diseases. Probably, the secret of success depends upon the proper understanding of the patho physiology of the illness, adoption of classical line of treatment and estimation of the apt dosage form a particular disease/illness. Even though Ayurveda hides thousands together books in its treasure every information is explored to the who is interested dedicated and has intense urge to have those. Critical analysis and judicial application are the timely necessities that play important role in fostering the principles of the treatment of the diseases. Madhava Nidhana (but, the true name of the text was Rogavinischaya or Rukvinischaya) is a well known treatise which has taken appreciation by the large mass in ayurvedic field of understanding the patho physiology (Roganidana). It is the earnest help and contribution of Acharya Madhavakara, who is the son of Acharaya Indukara. His time period is devoted to be 7th century. Later several commentaries were also written on this noble text and presently available for the readers too. There is no any doubt that book Rogavinichaya/Madhavanidhana has served all means of patho physiology/Roganidana of most of the disceases. The text is complete in 83 chapters and discusses hundreds together various minor and major disorders. The text has taken appreciation for its systematic presentation of Roganidana – Purvaroopa rupa upashaya and Samprapti. Almost all diseases which are routinely diagnosed (except the diseases of modern understanding) and treated are explained in this tex. Due to the same reason it is proclaimed that “Nidane Madhav Shreshtaha” i.e. Acharya Madhavakar is the archetype among the pathologists of the time. Hense, the nobleness of this text and author remains as an undebatable task. The question still remains to everybody is that why such an authentic and authoritative Acharya Madahava remained silent with respect to treatment? 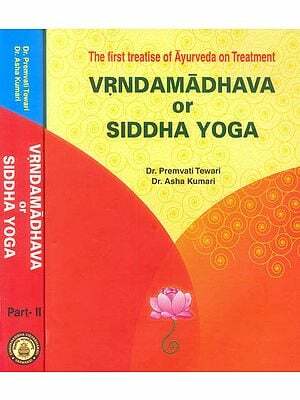 After a thorough review of this text Madhava Chikitsa Surely one will appreciate his another compendium of work in the field of treatment too. Madhava Chikitsa, surely a text of Acharya Madavakara, son of Acharya Indukara. Even though there are sufficient points left in the ext to determine that the same author Madhavakara of Madhavanidana/Rogavinishaya, wrote this Madhava Chikitsa too, some of the recent scholars have the different of opinion that the text is not so ancient. Usage of some of newer drugs and grammatical errors scattered in between the verses are the major points for such arguments. Anyhow. Being a translator I have no argument and debate in any these respects; but, thorough review inclines towards the same author (Author of Madhava Nidana) of 7th century. But in due course of time, (in between 7th century - 16th century) probably some of the verses/words may be adjoined with the earlier verses/words. 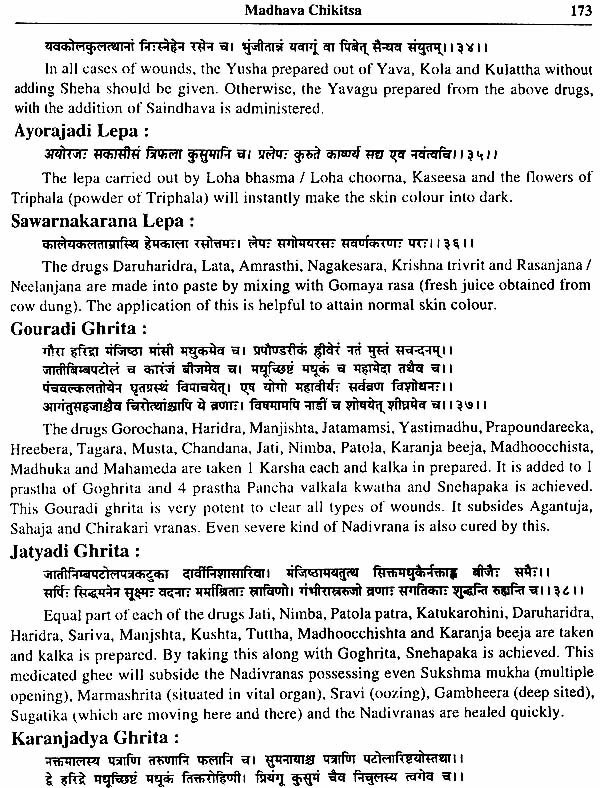 Another important factor, I want to bring to the notice of the readers is that this, text is still incomplete in some of the areas/diseases and such portions still needs completion (Sampoorana) and the revision (Punaravalokana) for better understanding and proper conveying. If the people of greater intellect and scholastic minds work together in this regard surely the worth outputs may be appreciated soon. This may be a good material even for post doctoral work too. After a hard effort and survey, I could collect three scripts of Madhava Chikitsa, among which two were in Kannada (old Kannada hand written script – 1952 & 1955) and another was Hindi translation carried in the editorial ship of Vaidya Mohanlal Dadheecha (1979). One of the hands written scripts (obtained by late Vd. Shambhu Sharma, south Kanara) refers this text as Madhavi Chikitsa. Whereas Hindi translation of Vd. Manoharlal Dhadheecha (published by Shri Bhamvarlal Dooghad, Ayurveds Vishwabharati, Rajasthan) is complete with respect to all the chapter. The editor has tries hard to give notes and comment on the various context and verses. It becomes Mandatory to memorise the great effort of those scholars, who have given sufficient impetus in the collection, correction, presentation and transfer of the knowledge to the large mass. Most of the chapter discussed in Madhava Chikitsa are at par with the sequence of the chapter of Madhava Nidana. The line of treatments specified (in some of the diseases) is the true verses referred from either of Charaka Samhita, Sushruta Samhita, Chakradutta, Yogaratnakara or Bhavaprakasha. Some of the formulation quoted in the Vrindamadhava is found here also. Unique references and specific mentioning are also cited here and there. The Ubhaya Panchadashaka Yantra and Ubhaya trimshaka yantra mentioned under Striroga Chikitsa are unique references which determine the incorporation of Tantric ways in Ayurvedic practices. Madhavakara, being a scholar of Shaiva sampradaya (by name Vaishnava?) surely hides out the practices of his time period. (In Mangalacharana also the author appraises Lord Shiva). The author is very keen bout the wholesome and unwholesome diet and habits in each disease. Instead of giving of long of such substances/matter author has given the routinely practiced food and beverage in this context. The author Madhavakara refers the use of various acidic fermented products (Kanjika, Souveera, Shukla Chukra etc.) in most of the diseases. Rasashstric preparations are referred in lesser contexts. As a part of Daivavyapashraya and Satvavajaya chikitsa several Mantra (Sacred hymns) and Bali (sacred oblages) are mentioned in the test and it looks different from the primordial literatures Charaka Samhita, Sushruta Samhita and Ashtanga Samgratha/Hridaya. In my endeavor of translating a less available text Madhava Chikitsa, Several Schoolars, teachers resource persons colleagues and my postgraduate scholars have helped in different ways. It will not be an easy task to quote all of them. With mute reverence I pay my obeisance to the elders and with the best to my juniors. My heartfelt thanks are due to all of them. My preceptor prof. Dr. H.M. Chandola Head of The Dept. Kayachikitsa and Rogindana & Vikriti Vignana and executive editor of Ayu IPGT&R, Jamnagar has blessed me with his scholarly foreword. I how my head and submit my deep reverence to his fatherly affection, brotherly suggestion, friendly attachment and moreover Godly guidance. I am very much thankful to Dr. M.Mohan Alva, Chairman of Alva’s education foundation ® Moodabidri for his best wishes. I express my sincere gratitude to my father Shri Muliya Sankar Bhat and mother Mrs. Gowri S. Bhat for their blessings. I am thankful for the support and encouragement of the principal and colleagues of Alva’s Ayurveda medical college, Moodbidri. I cannot conclude this preface without acknowledging thanks to my wife Mrs padmashree and daughter Maithree. I am highly thankful to Mr. Atul Gupta and his team of M/S Chaukhambha Orientalia, Varanasi for publishing this book in a beautiful manner.